The S-B: CAN HELEN MIRREN, GRACE CODDINGTON & CO SAVE M&S? I like Helen Mirren. I like her a lot. She is strong (in a good way), smart, outspoken, good at her job. She's not terrifyingly perfect. The same goes for Tracey Emin. Laura Mvula. Nicola Adams. Katie Piper. Monica Ali. Grace Coddington and Karen Elson have a special place in my (ginger) heart. But they are all women who, first and foremost, stand out in their chosen fields. So I couldn't be more delighted that M&S have chosen them (amongst others) to star in the ad campaign for their relaunched AW13 fashion range. 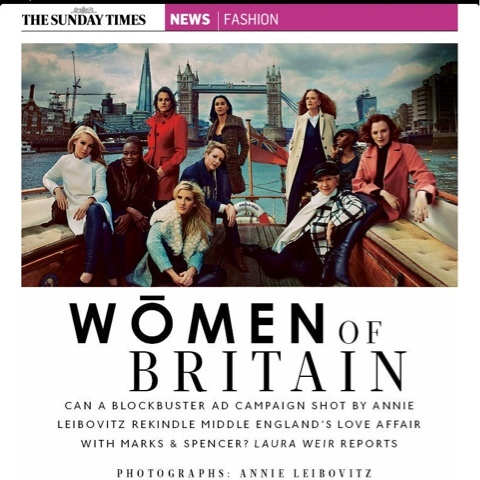 See the pic here from today's Sunday Times Style magazine, shot by Annie Leibowitz, herself one of the most successful photographers in the world. That she is a woman is an irrelevance. But... You knew there was a 'but' didn't you? Just because I admire these women doesn't mean I will want to wear the clothes. "Good old M&S" (TM) has had a rough time of late. For the last three years, to be exact, with women's clothing sales declining for the last eight quarters. It wasn't just the much-documented drop in quality, it was the lack of inspiration. The sea of bad trousers, dodgily merchandised in not quite the right fabric, the cut just that little bit off. Yes, I know black trousers are their number #1 seller, but wouldn't you hope to entice your black-trouser customer to try a little something else with that? I'm sure I'm not the only one who hasn't needed blinkers to cut straight through clothing to get to food without feeling tempted by anything other than Percy Pigs. It's a long time since I bought even so much as a three-pack of knickers. And the problem is, whilst this new collection is undeniably better, I'm still not feeling the siren call of my credit card. Maybe I'm not the target customer, but this ad seems to be saying, I am - we all are. And hasn't that always been M&S's problem? We can't all be M&S Woman, much as they might want us to be. I have total respect for Tracey Emin and all she stands for, but do I want that red coat because she's wearing it in an ad? Nope.